Woohoo no repeats this week! I'm also super pumped because I've had a couple people ask me about my 365 challenge! I'm so excited that there are actually people out there that care!! Sure, they were all people I knew, but still! My sister in particular seems very interested. She's been a great source for ideas on how to keep things spicy in terms of post ideas, so thanks Big Sis! Even though I know American Apparel is full of expensive hipster basics, I also know that I'm in love with expensive hipster basics. I've been trying to figure out how to categorize my style, but I'm having a really hard time separating what styles I admire and love, but which I don't really embody in real life. Could I say I'm a vintage hipster kawaii wannabe?? Cranberry is a really amazing color. I have yet to see it look like crap on anyone. It's not super red, which can be tough for some to pull off, and it's not super bright, which the fashionably conservative don't like, but it's also a color, which satisfies people like me. 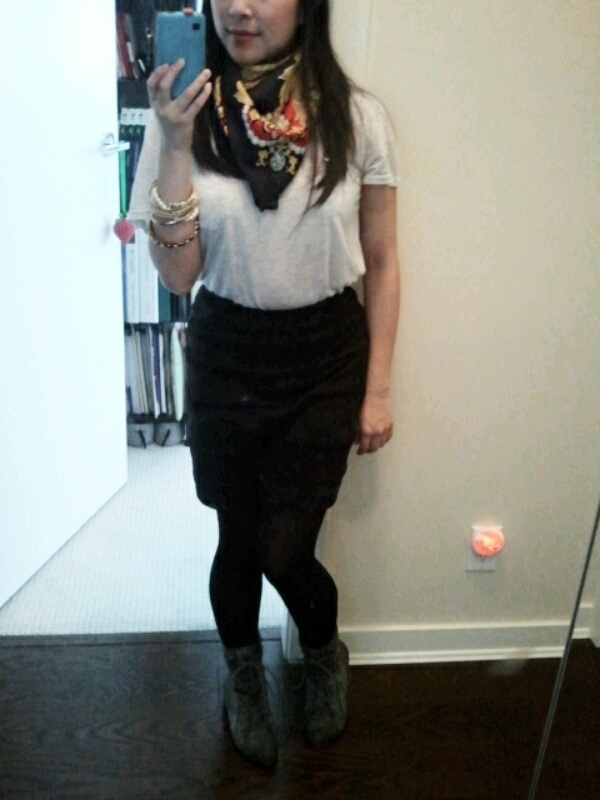 I seem to like wearing color when it's dark and grey out, and black when it's sunny. Some would call that contradictory. I basically based this outfit on the accessories: these bangles gifted to me by the fun-loving Elisse, and this scarf I picked up during a recent retail therapy session. I found this scarf for $10 at a somewhat sketchy looking vintage shop near a scuzzy part of town aka. where my too-trendy-to-care office resides. Working in this part of town makes me feel chic like Samantha from SATC and her meat-packing district digs. I don't think I'll be making friends with any ladies of the night though as 1) I work during the day and 2) the locals here are nowhere near as fabulous. That's all for this week! 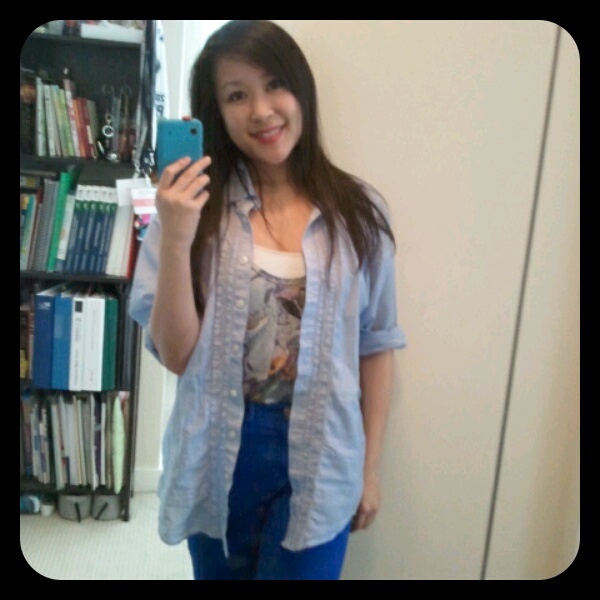 Be sure to follow my daily 365 updates on my Twitter here and at the hashtag #365outfit! hehe of course we care! We love the 365 challenge. 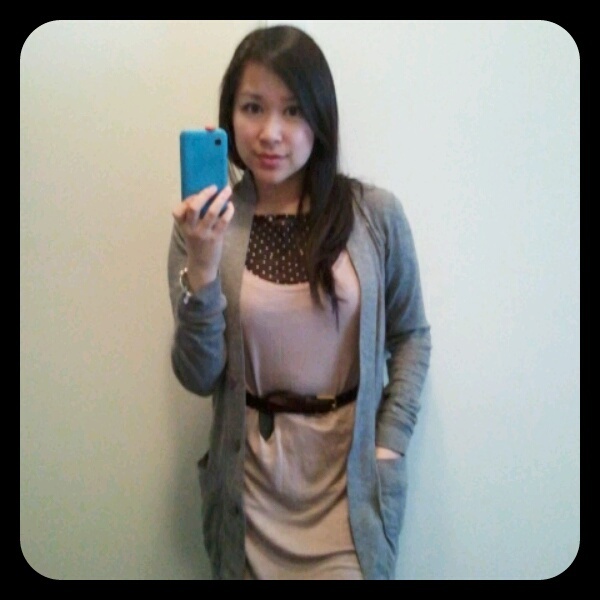 I really like the layering you did with the polka dot top, dress and cardigan. Also love the cobalt jeans on you! Nice and bright. The cranberry outfit lends a sophistication to the lok - I like it. 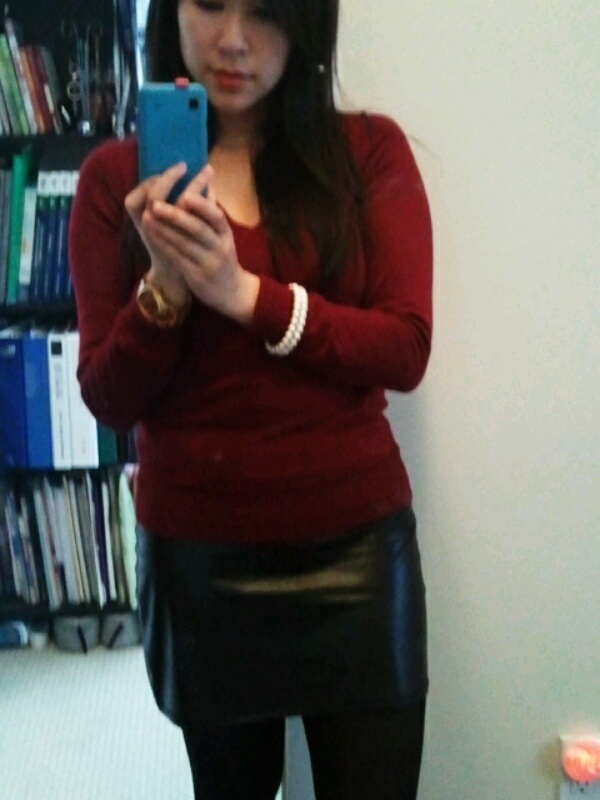 Love that faux leather skirt! When I went to school at night, to get to the subway I had to walk through an area where ladies of the evening trolled for business...the real ones were not fabulous at all.